How many of you right now feel as if something is missing even though you just had a meal? How many of you are drooling over photos of sweet desserts after dinner? Or how many of you already got ready to go out for some snacks? Then I’m sure this Bungeoppang is for you! 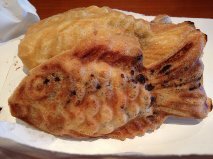 As you can see from the photo above, Bungeoppang is a pastry made in the shape of a fish called Carassius, commonly known as Crucian carp, which comes under the ray-finned fish family, and dark-brown red bean paste fills the inside of the golden toasted bread – so don’t expect there to be real fish inside! 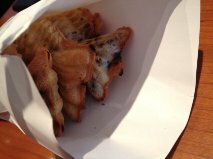 During the winter season, it is absolutely one of the hottest-selling snacks in Korea; firstly because one bite of it warms the whole body in the freezing weather and at such a cheap price (generally ₩1000, or about $1, for three), and secondly, just like Starbucks, vendors selling Bungeoppang can be found on almost every street corner. Try to imagine yourself walking down the street, exhausted after a long day’s work, when suddently the savory aroma of Bungeoppang wafting through the air tickles your nose. Who couldn’t resist stopping by for a moment to enjoy some of these appetizing fish cakes? Some of you might be confused and think, “the one I have in my hand looks exactly like a Bungeoppang but has a different taste.” Yes! Here is the good news for those who don’t really like red beans: The original filling of this bread, which always has been my favourite, is red bean paste, but more and more versions of fillings seem to come out each year such as pizza sauce and toppings, custard creme, sweet potatoes, spicy vegetables, etc. Now, what is your favourite among these mouth-watering choices? You see, there are three main parts to this fish cake: the upper jaw, stomach, and the tail. But have you ever imagined that there might be a reason for this? I’m telling you, it’s almost like having a three-course meal in a fine restaurant. Your first bite starts with the upper jaw, the golden tender bread, that works up an appetite; next comes the stomach, the superb combination of soft bread and sweet red bean paste that satisfies and delights the diner as the main dish; and last but not least, the dessert, the crunchy tail at the end. Can you see what I’m getting at? So that’s my personal recommendation to you: Start eating from the upper jaw, not from the tail, in order to save the best for last! They sell these at PAT, a Korean market near Bathurst in downtown Toronto. They are only $1.50 per piece! Now they come in different shapes but I always prefer the fish-shaped originals.